Laundry machine, TV, WIFI, bed and bath linen included. The apartments are NON SMOKING. You may smoke on the terrasse. Free parking is available on the street near the apartments. The price includes everything, like cleaning, bed linen, towels, kitchen accessories, WIFI, etc. Beautiful central apartment of 38m2 for one to two people. 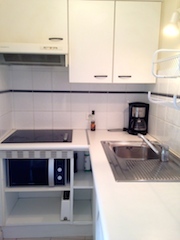 Central apartment of 38m2 for one to two people. It has an incredible view of the bay of Villefranche sur mer. The apartment is organized around a living room with an open kitchen, and a bedroom with a bathroom, followed by a small sunny terrace with the view of the sea. The apartment is NON SMOKING. You can smoke in terrace. 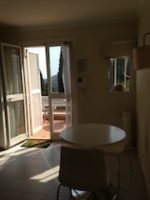 Lovely studio with terrasse ideally located just a 5 minutes walk from shops, cafés and the bus stops to Nice and Monaco. It’s only a 10-15 minutes walk to the sea and the old town of Villefranche-sur-Mer. 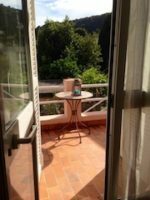 1 room with double bed, separate kitchen, 1 bathroom with shower, Terrace. 1-2 persons, 30 m2 With one double bed, it’s ideal for couples and singles. Next to everything you should need for a nice and relaxing holiday.